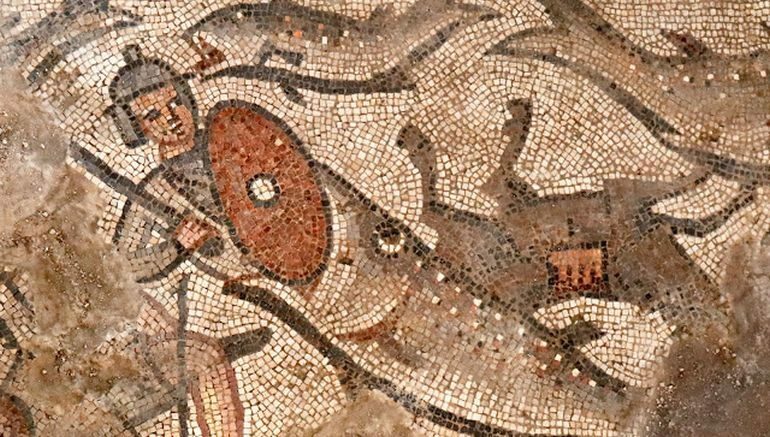 Excavations at an ancient synagogue have unveiled very rare mosaic specimens that originally embellished the floor of the building. Situated at Huqoq, an ancient Jewish village, in Israel’s Lower Galilee, the synagogue in itself harks backs to the late Roman period (circa 5th century AD). As for the mosaics in question, these ancient objects, found along the floor of the synagogue’s nave (at the center of its hall), depict a plethora of Biblical scenes, including – Noah’s Ark and his adventure, and the parting of the Red Sea. These scenes are very rare in ancient synagogues. The only other examples that have been found are at Gerasa/Jerash in Jordan and Mopsuestia/Misis in Turkey (Noah’s Ark), and at Khirbet Wadi Hamam in Israel and Dura Europos in Syria (the parting of the Red Sea). Pair of donkeys in Noah’s Ark scene. The archaeological team (from University of North Carolina) has been discovering these rare mosaic specimens within the site’s parameters from 2012; and since then annual excavations are been carried out during the summer seasons. To that end, the first discovered mosaic depicts the Bible’s Judges 15:4 scene of Samson and the foxes. 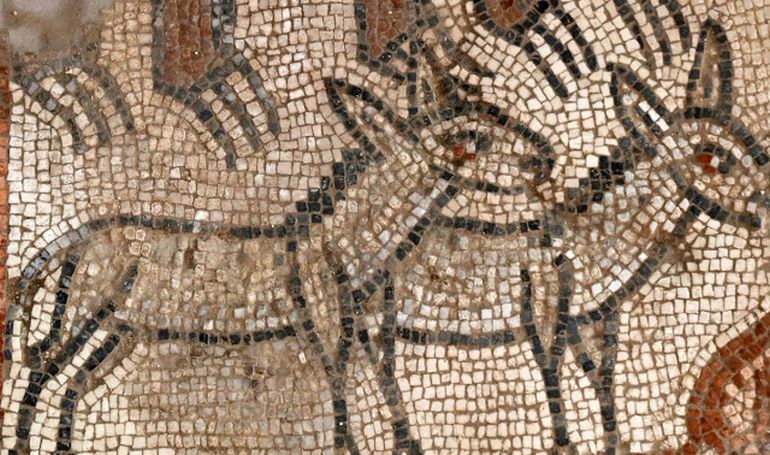 Subsequent mosaics represent other Biblical stories, like the one alluding to Samson carrying the gate of Gaza – mentioned in Judges 16:3. Interestingly enough, the researchers had also come across a particular mosaic that depicts a historical episode rather than a Biblical one. It is possibly related to an apparent legendary meeting between Alexander the Great and the Jewish high priest. However, in spite of the presumed historicity, this mosaic is also etched with other figures, including animals and mythological creatures like putti (cupids). In any case, from the archaeological perspective, the ancient synagogue from 5th century is considered to have one of the most extensive collections of biblical stories being presented through mosaic art. Suffice it to say, there are more decorative floor pieces still left to be unearthed – with the researchers expecting to return in summer of 2017.